Why Do The Cardinals Have To Honor Derek Jeter? So, here we are at last — the New York Yankees return to St. Louis for their first-ever games at Busch Stadium III (even though it’s rarely referred to as Busch III anymore since this is the ninth season the Cardinals have been playing there). Which means The Derek Jeter Final Season Tour also is making its latest stop. As you’ve no doubt heard, time and time again, this is Jeter’s final season. And you’ve likely heard as well about the gifts every team has showered upon him as a result. Why they have to do that, I’m not exactly sure. Yes, he’s a great baseball player (and, honestly, I do like him). But, for the second straight year, a Yankee has conveniently announced before a season begins that this will be his last season before retiring and thus every team on the Yankees schedule has been forced to produce A Farewell Ceremony Filled With Useless Gifts That The Guy Doesn’t Need Nor Likely Want But They’re Required To Do Something Anyway. Now, today, it’s the Cardinals’ turn for the retirement ceremony. It’s not like there’s a long history between Derek Jeter and the Cardinals. He’s in his 20th season now and has played in 2,644 regular season games through yesterday. Six of those have been against the Cardinals — three in 2003 at old Yankee Stadium, three in 2005 at Busch Stadium II. Yet thanks to a quirk in scheduling of 2014 finally being the time when the Yankees and Cardinals play again, we now have to see a ceremony today with the Cardinals honoring Jeter. Sure, it’s spun correctly in the Homestand Highlights news release the Cardinals sent out a couple days ago — “In a ceremony prior to the game, the Cardinals will present Derek Jeter with a retirement gift in honor of his career and impact on the game of baseball.” And it’s very cool that the Cardinals own No. 2, Red Schoendienst, will be involved with the presentation, as well as Hall of Fame shortstop Ozzie Smith. Even weirder: Jeter merchandise for sale at Busch, as Derrick Goold tweeted on Thursday. And as I said, I honestly do like Derek Jeter. My friend Kat is a die-hard Yankees fan — we were at two of the three games at Busch II in 2005 and even witnessed this from Mariano Rivera — and Jeter is her favorite player. For years we’ve referred to him as “DD,” short for “Dreamy Derek.” Yep, he’s dreamy. Great player. Had some amazing moments, both in regular season games and obviously in the post-season. 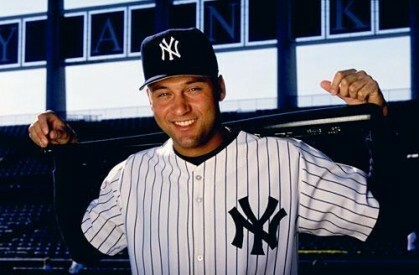 I cheered for him when I went to a game at Yankee Stadium in 2008. I probably even cheered for him in 2005 at Busch Stadium. But that doesn’t mean I understand why today’s ceremony is necessary by a team against whom Jeter’s had 26 at-bats — even if he’s hitting .308/.333/.423 against the Cards. And, thankfully, I see I’m not alone in my feelings. This entry was posted in 2014 Cardinals and tagged Derek Jeter, New York Yankees by Christine Coleman. Bookmark the permalink.